Here are the Power-Ups that are available in the game. Use them well in order to get a high score! Ahh, the Shovel. A farmer's most trusty tool. Shovels can be purchased on most levels, before starting the level (and used whenever needed), or during the level. After you purchase a Shovel, it will appear on your Power-Ups bar. Tapping the Shovel will bring up an arrow that points to a specific spot on the game board. Move this arrow to the desired spot on the board you wish to dig up with the Shovel, and then click Yes to use the Shovel. The Shovel will dig up the item on that spot and remove it from the board. If it's a Crop, it will harvest it! The Crate is another useful tool on the farm. You can purchase a Crate during a level, and swap out any board item for the Crate. 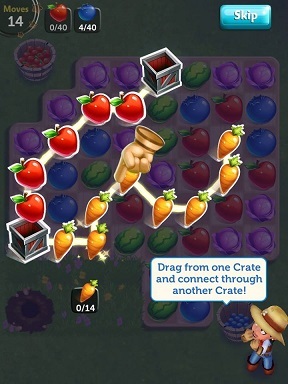 Once you've got your Crate on the board, you can use it to start a chain by dragging from the Crate, through as many crops of the same type as you can get to. The chain can go horizontally, vertically, or diagonally, and can even be chained through multiple crates. AND, each time you add a new Crate to the chain, you can use a different Crop type for the next section of the chain! Isn't that wild?!? Using a Wheelbarrow is a great way to collect a bunch of same-type Crops at once. The Wheelbarrow can be purchased during a level, and placed on top of any Crop on the board. Once it's placed, it will collect all of that same Crop type on the board. Great for Crop collection levels! Sometimes, a few extra moves make all the difference. For those occasions, you can purchase Extra Moves. This power-up is available before the level begins, or after you run out of moves, and can be purchased with Diamonds. Who couldn't use a little more sun? 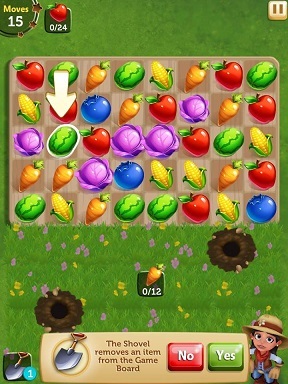 Purchase the Sunbeam power-up and you'll get additional Sunbeams added to Crops on the board to start the level. These can then be used to quickly clear our rows of Crops! This can be especially useful on levels with lots of Hazards. Now let's try out these awesome Power-Ups!